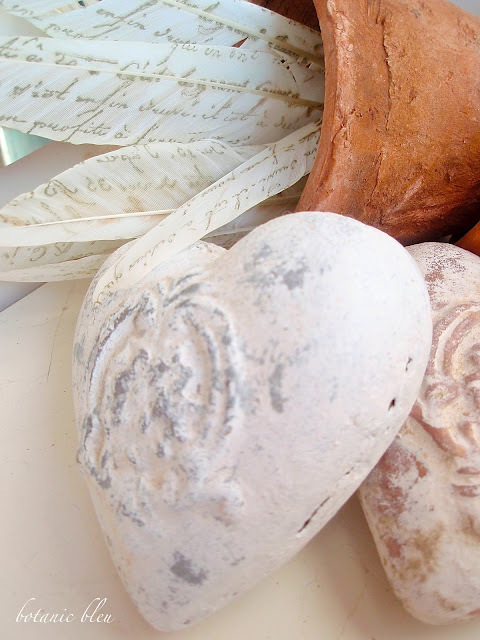 Hearts are some of my favorite things and are scattered all around our house. February is the month of love... for both family and friends. Later this month I will host a friendship lunch for some good friends who volunteered to help work during the annual Regional Academic Decathlon Competition that I have been coordinating for the past six years, and I'm spotlighting the hearts to send some friendship love to all of them. To go with the hearts on the white bookshelf in the sunspace... aka as my makeshift indoor potting table... I added a couple of small clay rose pots to the hearts, but the arrangement looked rather bland. Remember the hand-stamped-with-gold French script feathers that I made? They are just the right size to fit into the rose clay pots and add a little flair to the arrangement. Stamping feathers is super easy to do and only takes a few minutes. Try it.... you will love it! 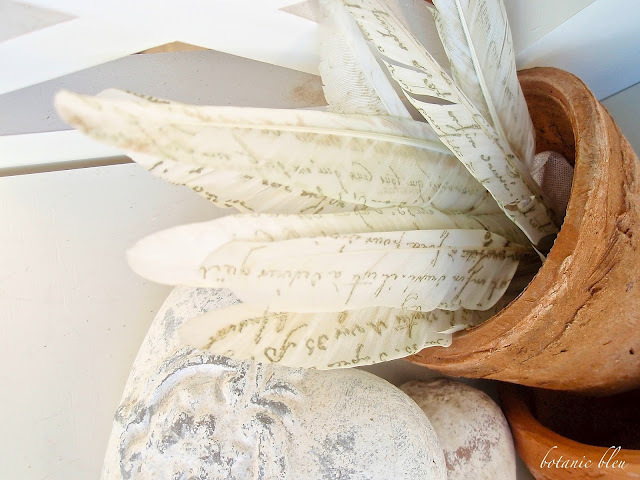 If you are decorating for February and don't have any hand-stamped French script feathers, a small 4-inch starter herb plant would be another great filler in a clay pot to add some zing to the grouping. A couple of years ago, fresh mint starter plants were what I planted in rose clay pots for the Friendship Luncheon that year. Each of the friendship honorees got to take home one of the mint plants. Yes, those are the very plants in the photo in my blog header. Adding just that small cluster of feathers makes all the difference. Hmmm... perhaps the little feathers would be a nice touch to add to a small favor for each of this year's attendees. 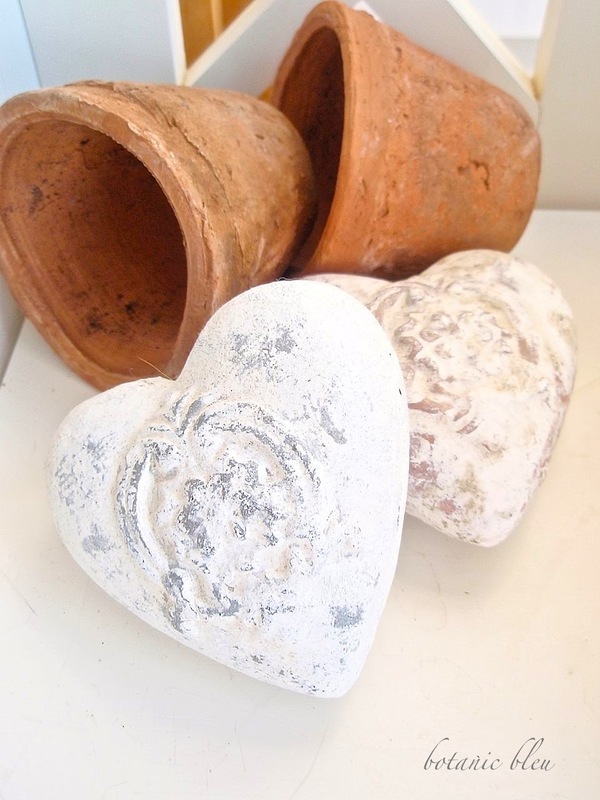 Any suggestions for other things to put in the clay pots to give the arrangement of small hearts a special touch? Their button grabbed me right away... all that beautiful blue. celebrating friendship, decorating, recipes, gardening, and inspiration. It has been far too long since I've visited you! I had quit my blog and now I am on Instagram, but I do make some rounds to blogs in the morning before I rush off to work. This has been a life-changing school year, and I no longer have much time in the morning to engage in blogging. HOWEVER, I wanted to thank you for mentioning me in a comment over at Jemma's blog. YES! Our great room is going to be on the cover of French Country Living magazine (at least that is what I was told) but other rooms of the house will also be on the inside. The issue is due out this spring (not sure when) but I DO still post on my blog occasionally to announce certain things. If you still get my blog posts on your roll, you will see. THANK YOU! I am thrilled to see you again! Love these feathers. I have a set of paper feathers with script but I like this version even better! Your vignette is lovely. Where did you find the stamps you used on the feathers? 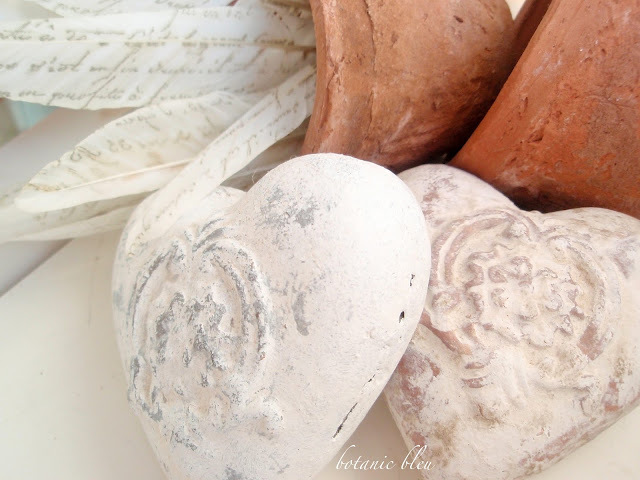 I wouldn't add anything more to the clay pots ~ they are absolutely perfect. Thank you SO very much for the lovely shout out Judith. You are a gem. 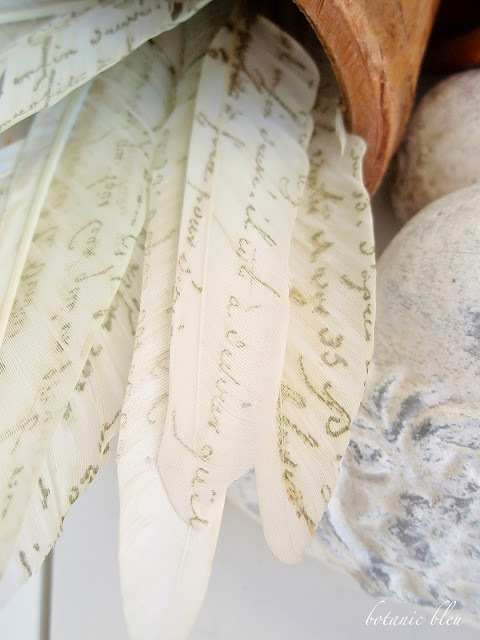 I absolutely adore those stamped feathers and am bookmarking your post. These are perfect Judith, so very lovely. Thank you ever so much for this heartwarming shout out! It feels like love is in the air here. Oh now, that is just gorgeous. The hearts, the clay pots. . .the feathers! Had to look at your link about those (feathers), and I have GOT to try something like this myself. So pretty! It looks so nice the way it is but I would probably stick an old fashioned Valentine in the center. I usually do too much though and have to take things away in my vignettes. Hugs! That is gorgeous. I love those feathers. Judith, these are lovely. I remember the feathers, but had forgotten all about them. I must make some! Love the idea. The hearts are gorgeous too. Did you paint those or were they like that when you bought them. Lots of texture! Judith, we missed you at lunch today. Hope you can come next time. 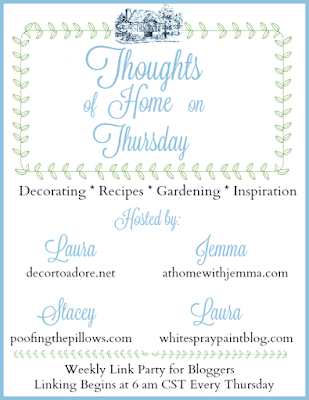 Thanks so much for linking with Thoughts of Home on Thursday. Thank you for your good vibes and sweet note to me. Your hearts and feathers are perfect! I wouldn't add another thing! I have stamped many things but never feathers. I'm going to pin this so I'll remember this unique element. I have made painted glitter feathers recently but I simply adore your stamped feathers - what a clever idea! Your stamped feathers are truly a work of art. I love them! Combined with your sweet hearts is total perfection! Thanks for sharing them with SYC. Oh. So. Pretty! I enjoyed reading your post and seeing your fabulous photos. I saw your post over at the "Table It Link Party". I have seen your feathers before, but this morning they inspire me. I think I'm going to look for white feathers on the beach as we walk! Loving the feathers and your clay pots. So pretty and vintage looking. Thanks for sharing at Your Inspired Design! Oh my gosh the pretty clay hearts are beautiful but the handstamped feathers are amazing! Pinned to share. 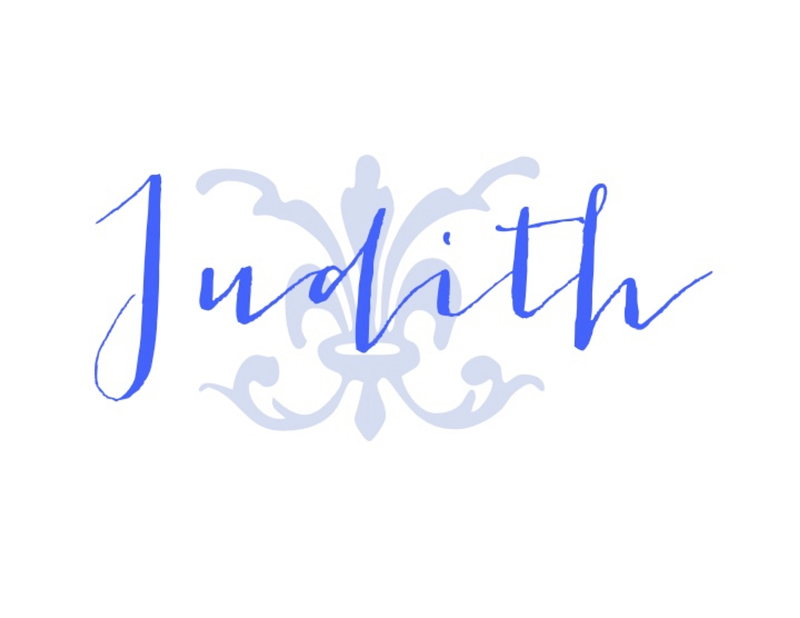 Hi Judith, just hopping by to let you know that I will be featuring you at SYC later today. I just love those feathers! Thanks for sharing at Home Sweet Home! Absolutely lovely; I'm especially partial to those hearts. I think mini loaves of french bread (think biscotti size) might be fitting tucked inside the pots. This is so pretty! I'm loving those hearts. 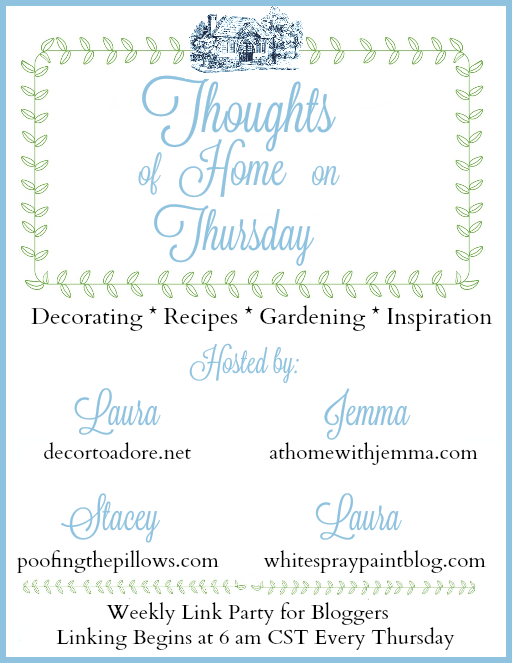 It would be awesome to have you at the Inspiration Thursday link party at my blog inthenewhouse.com. I hope to see you there! Thank you so much for stopping by! Happy to party with you this week.